Today just a few snapshots of a few Infinity models I started working on during a few days of illness some weeks ago. The girl in the left I actually sculpted myself for the Hasslefree painting competition 2012. She also has some wings but I will paint those seperately. 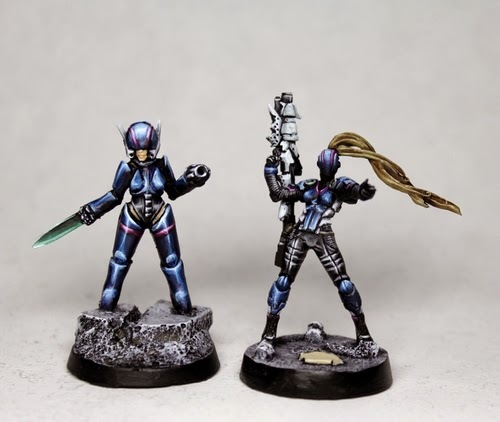 The lady in the left is an original Infinity figure. I have to admit that I haven't played since summer 2012 when I ran an Infinity demo table at a convention but I still really like the models (Nomads mostly as you may have noticed from earlier posts, along with some Haqqislam for contrast). It's a rather new model, the Wildcat with Heavy Rocket Launcher.I really like her pose. I mean it's silly but that's what Infinity is. These days, most of their models seem to be sculpted to be posing rathern than being in a combat zone. WIP it, WIP it real good! Great stuff sigur. The black-blues are just fantastic. Orange as the pop colour works perfectly. Can't wait to see more! Should have said "pink", not "orange". D'oh!